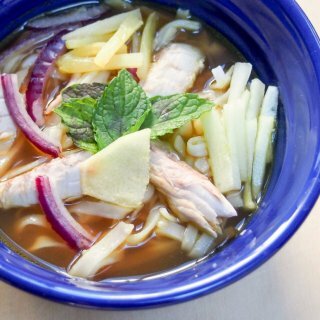 A tart-spicy broth, noodles and fish are the base of this tasty Malaysian dish. Prepare spice paste ingredients - deseed and roughly chop the chilis, peel and dice the shallots, remove outer layer of lemongrass and finely chop, peel the garlic, turmeric, and ginger and roughly chop. Place all in a blender along with the shrimp paste and blend until smooth. Place the cleaned mackerel in a large pot with the water and bring to the boil. Boil for 10 minutes then remove the fish. Add the spice paste, tamarind concentrate and Vietnamese mint (if using) to the fishy broth. Carefully remove the fish flesh from the bones and set it aside then put the bones in a piece of muslim cloth, tie it up and add back to the stock so they can infuse it without going into the broth. Reduce to a simmer and cook another 10-20 minutes. While the broth is cooking, cook the rice noodles according to packet instructions and drain. Prepare garnishes by cutting the cucumber, pineapple and onion into thin slices (typically you skin and remove seeds from cucumber but as you prefer). Add some noodles to the bottom of some bowls. Remove the muslim bundle of bones from the broth and the mint sprig. Add in sugar, salt and adjust seasoning to taste. Pour some broth over the noodles then top with some chunks of fish and your choice of garnishes, or allow people to add themselves. Serve immediately.